As I'm fully concentrating my free time on my own PB project (beside the german PureBasic support), there is no time left for optical improvements / more additions on PureArea.net, sorry! But here is a new entry in the 'News' section with some important informations. See the original on my website for all screenshots! GFX Wizzard BF now hosted on PureArea.net - PureBasic 5.70 on the way and PureVisionXP extension for SpiderBasic available! I'm proud to announce, that the awesome GFX package for PureBasic "GFX_Wizzard_BF" by Werner 'walbus' Albus is now available on PureArea.net. While it was continuously developed during the last 1.5 years, it's now finished for the current PB5.62 versions. - use and combine functions for rotating, mirroring, recoloring, texturing, resizing, scrolling, etc. The professional GUI designer PureVisionXP is also regularly updated by ReelMedia and just got a new extension module to create SpiderBasic GUI's too. Like all SpiderBasic and PureBasic versions (including business and eductional licences) you can order it here - just take a look on my updated order site! My own project (working title 'GeoWorld') grows well, I invest all my free time and hope to have a first beta later this year. Stay tuned! Looks really good, Andre. The editor has a well-thought-out UI and is very intuitive. Last week Fred released the first beta version of PB5.70. 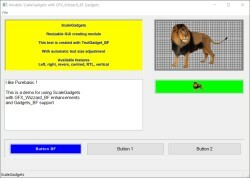 To their most important innovations belong the support of the "Qt" sub-system on Linux, "DPI aware" support on Windows and many new 3D commands (OGRE). More informations and the complete list of functions in the related thread of the English PB forum. On our own behalf: We take your privacy very seriously! This means, that the use of PureArea.net does not collect any* personal information about you. For all costumers of PureBasic, SpiderBasic or PureVisionXP licences, the data storage is limited to the bare essentials, namely the order data required to register and provide the full versions. Some weeks ago Fred released a 2nd beta version of the upcoming next PB version (available to all registered users). It does include not only bug-fixes, but amazing improvements too: MySQL and MariaDB support (sponsored by Paul, the PureVisionXP creator) and HttpRequest for easily calling the 'rest' API (sponsored by c-wayne). Hi Andre, thank you for the update ! Feel free to distribute them too. Like before I present today two PB modules, dedicated to GFX effects and GUI creation, both completely free and with source. When it comes to scaling windows and gadgets (including its content like images and text displays) they are able to work together now - ScaleGadgets by 'mk-soft' and the "Gadgets_BF" in the GFX_Wizzard package by 'walbus'. "I am pleased to announce that the outstanding ScaleGadgets module from mk-soft can now work with the GFX_Wizzard_BF. It is now possible to use the extended Gadgets_BF without restrictions and easy to use with this module together with all PB Gadgets. Michael (mk-soft) and I were able to realize this together within a very short time. Not only the result of the cooperation of two coders, but also the possibility of easy data exchange and cooperation between the modules is shown. The demo code can be found in the GFX_Wizzard_BF archive under the name _ScaleGadgets.pb." The 'BGames' team released several PB games made with PureBasic like the famous 'Lethal Judgement' series as freeware now - preview pics and download see here (french).